The Legacy of Luther – R.C. Sproul and Stephen Nichols, Ed. On October 31, 1517, Martin Luther nailed the Ninety-Five Theses to the castle door in Wittenberg. One act of courage sparked a theological firestorm in Germany that set the world able in a matter of days. Spreading like wildfire, thousands were introduced to the gospel, which is received by grace alone, through faith alone, in Christ alone. The Legacy of Luther celebrates the accomplishments of this godly man. Edited by R.C. Sproul and Stephen Nichols, the book surveys Luther’s life, thought, and ultimately his legacy. A wide range of pastors and theologians contribute to this volume; men like Steven J. Lawson, Michael Horton, Sinclair Ferguson, and Derek Thomas, to name a few. The Legacy of Luther is a sweeping look at the German Reformer. The book contains basic information that will appeal to first-time students of Luther. But it is also filled with a wealth of information that will satisfy the most deeply entrenched Luther scholar. The Legacy of Luther certainly honors a significant man who stands head and shoulders above most others in church history. But at the end of the day, the book does not exalt a man; the book exalts the gospel of grace and celebrates the accomplishments of our Savior. The neglected gospel truths which were recovered by the Reformers are proclaimed with passion in zeal in this important volume. Readers may be interested in my recently published book, Bold Reformer: Celebrating the Gospel-Centered Convictions of Martin Luther. I will never forget reading the first installment of Steven Lawson’s series in the Long Line of Godly Men Profiles. The Expository Genius of John Calvin riveted my attention and engaged my mind. This book captivated my imagination and challenged my studying habits. The first volume reminded me about the importance and preciousness of our Christian heritage and the great men of God who lined the halls of church history. Since that first book, nine additional books have been added to the series, including the latest, The Passionate Preaching of Martyn Lloyd-Jones. Dr. Lawson includes an illuminating biographical summary of the great Welsh preacher and demonstrates how God not only regenerated his sinful heart, but also how he ordered his steps to serve as pastor of Westminster Chapel in London for most of his adult life. A sizable portion of the book is devoted to the preaching of Lloyd-Jones. His passion for the Word of God is explained and his theological convictions are explored. For anyone who has any doubts that Lloyd-Jones was a fiery five-point Calvinist, those doubts will be extinguished here. He was a committed Reformed theologian whose sermons were drenched in the doctrines of grace. Dr. Lawson helps readers understand the important role that theology played in the ministry of Lloyd-Jones. His sermons were doctrinally driven and theologically charged. Unlike many preachers in the present day, there was no ambiguity in Lloyd-Jones. His listeners knew exactly where he stood. The highest authority in his life was the Bible. Additionally, the author clearly articulates the passion that Lloyd-Jones had for preaching expository sermons. “The primary task of the Church and of the Christian minister is the preaching of the Word of God,” argued Lloyd-Jones. Lawson adds, “This allegiance to expository preaching was completely foreign to most pulpits at that time in England.” Such a reminder should motivate preachers in our generation to faithfully preach expository sermons. To do any less would be treasonous and an affront to God. The Passionate Preaching of Martyn Lloyd-Jones is a book for aspiring preachers and veteran preachers alike. But it should not be limited to preachers exclusively. This book is for Christian leaders who need a fresh burst of encouragement. It is for Christ-followers who need inspiration as they make their way to the Celestial City. The Passionate Preaching of Martyn Lloyd-Jones is a vivid reminder about the importance of faithful preaching. It is a reminder that behind every solid expository sermon is a man who walks with Jesus and submits to the Holy Spirit. This book is a monument of sorts that honors a great hero of the Christian faith. Indeed, this book honors a man who was very likely the most effective preacher of the 20th century. Preaching is at the very heart of the New Testament church. Yet many preachers find themselves struggling to prepare, lack the exegetical and theological tools to research adequately, and struggle to deliver sermons that connect with people. 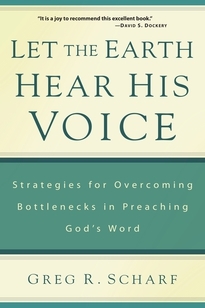 Greg R. Scharf identifies some of these homiletical struggles in his new book, Let the Earth Hear His Voice. His primary argument is that pastors have weaknesses which need to be identified in order to improve in the pulpit. He compares these struggles to bottlenecks that restrict the flow of God’s Word to his people. These bottlenecks need to be unclogged which will lead to a more effective preaching ministry. Speak as those assigned, equipped, and empowered to do so. Speak from the Bible in ways that reflect the Bible’s composition as a literary collection. Listen to God before they attempt to speak for God, discerning what he is saying. Understand those to whom God has called them to speak. Respect and reflect the clarity and orderliness of Scripture while discerning the way people hear. Respect and reflect the ways that Scripture communicates in stories, propositions, and images. Take seriously their role as messengers who also embody the message they proclaim. Each principle is subsequently viewed in a negative way. That is to say, each principle is viewed as one of the eight bottlenecks. The author describes the bottlenecks (unbelief, unqualified or disqualified preacher, faulty text selection, inadequate understanding of the text, inadequate contextualization, faulty organization, inadequate balance of proposition and illustration, and flawed delivery). Scharf carefully explains each bottleneck in the remaining chapters. He presents reasons for guarding against each respective bottleneck and strategies for overcoming them. The conclusion of each chapter contains practical exercises which are designed to help and encourage struggling shepherds. Let the Earth Hear His Voice is not a typical preaching book. Frankly, it stands alone in a growing list of excellent books. Scharf’s work is a welcome addition and a complement to books like The Supremacy of God in Preaching by John Piper, Preaching & Preachers by D. Martyn Lloyd-Jones, A Biblical Theology of Preaching by Jason Meyer, The Kind of Preaching God Blesses by Steven J. Lawson, and He is Not Silent: Preaching in a Postmodern World by J. Albert Mohler. Pastors would do well to absorb the excellent material in this book. May God use this book to his glory as pastors learn and discern their weakness and faithfully wield the mighty sword for the edification of God’s people!